Colloidal Silver Mineral Water (CSMW) is easy to make at home using distilled water and a properly designed power supply and is totally safe for all living creatures. The silver atomic particles are so small (1 nanometre) that they penetrate easily into microbes, do not accumulate in the body, and are excreted all too quickly. Our compact affordable CS1-T Portable Traveler’s Colloidal Generator for small volume travel use is designed to inactivate most bacteria and viruses in drinking water. It looks like a blender/mixer for ease of international travel and customs clearance. CS1-T will operate from 9 to 24 volts adapter, battery or automobile outlet with our adapter cable or hand crank dynamo or 1 watt solar panel. Higher voltage (24 volts) is recommended for non-conductive pure or distilled water. Charger generator of diameter 3.5” (9 cm) will fit on top of many cups and containers, consequently travelers may not need to carry our 600 ml container. CS1 makes professional quality (molecules less than 8 nanometers), 10-40 ppm colloidal silver solution. Concentration in ppm depends on the length of time water is treated. Using the provided container, will make 20 ounces (600 ml) of 5-40 ppm colloidal waters (Silver, Copper, Zinc, Magnesium); 5ppm in one hour or 20 ppm in 24 hours, or 40 ppm in 48 hours. This unit is not powerful enough for colloidal Gold or Platinum. 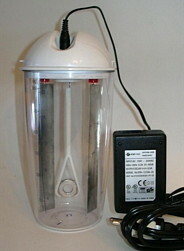 CS1-T generator can be placed over larger containers up to 4 litres using your own large 5 inch deep mason jar or glass fish bowl and our larger 2” x 5” electrodes with more prolonged charging for concentrated (25 to 50 ppm) colloidal waters. Alternating Polarity Self-Cleaning prevents oxide deposits (mud) on cathode. Constant Current maintains precise proper gentle trickle charging rate even with highly conductive mineral and tap waters and ensures smallest nanoparticles of size 1 to 8 nanometers for maximum effectiveness against the smallest vicious viruses (herpes, hepat, noro, encephalo, polio, flu). Stirrer motor internal 12v Mabuchi runs at 3 volts and will never burn out. Powered by any 9 to 24 volt AC/DC source with 2.1 mm plug, via 9 or 12 volt battery, hand-crank dynamo, 1 watt solar panel or international 24 volt supply provided. Uses only 1 watt. Will treat any kind of water (distilled, tap, spring, rain, hard, river, dirty, polluted, tea, coffee). Boiling alone will not kill Cryptosporidium cysts and some viruses. Yellow light indicates functioning of alternating timer, green light indicates integrity of current through water and electrodes. Large sheet electrodes for highest quality small particle size (not wires or thin rods). Contents: Container 20 ounces (600 ml), 2 solid sheet electrodes of 99.99% pure silver, 1 plain stirrer, original blender package and 24 volt international adapter included. We advise against using wires or thin rods due to their small surface areas which overdrives the electrodes with electric current and produces large particles and ions. We find that many customers would prefer to call us for help in selecting the best products to suit their needs. Please feel free to contact us by phone or email or use our easy Online Order Form. Notes: The basic colloidal generator does not include electrodes, power adapter, or magnetic stirrer. These options can be added according to your requirements. Our most common travel/portable configuration is shown above.